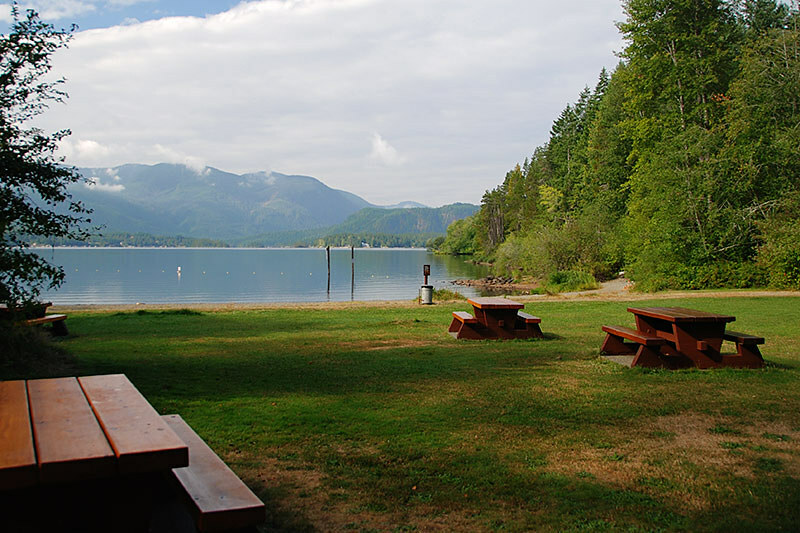 The beautiful Sproat Lake Provincial Park on the northeast shore of Sproat Lake in the Alberni Valley has a number of popular attractions, including a wonderful beach and crystal-clear water. 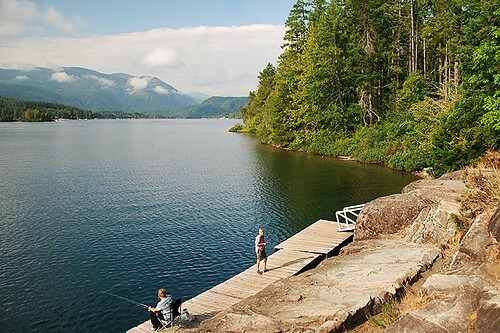 Sproat Lake is noted for its warm water and is favoured for fishing, swimming, water skiing and windsurfing when the wind is up. 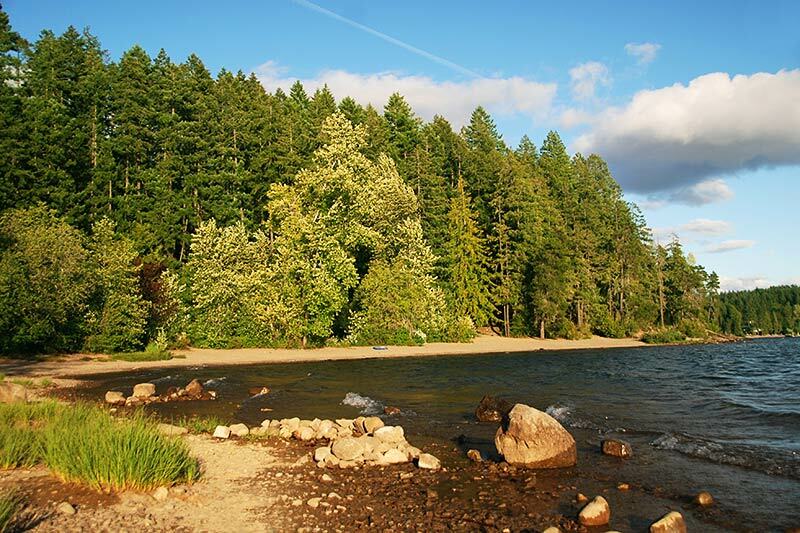 In the summer, this popular family camping destination can be crowded with boaters and anglers. As much as visitors are drawn west by the magnetism of Long Beach on the west coast, Sproat Lake Provincial Park has a fine beach of its own, and much warmer water than the ocean. The park sits beside a sheltered bay overlooking an expansive body of freshwater, with Mount Anderson rising to the south. Many of those who camp here come to take advantage of the triple boat launch and large public marina. In fact, there are twice as many boat slips as campsites. Throughout the park there are numerous hiking trails, with one leading to the prehistoric petroglyph, K’ak’awin, on the eastern end of the park. 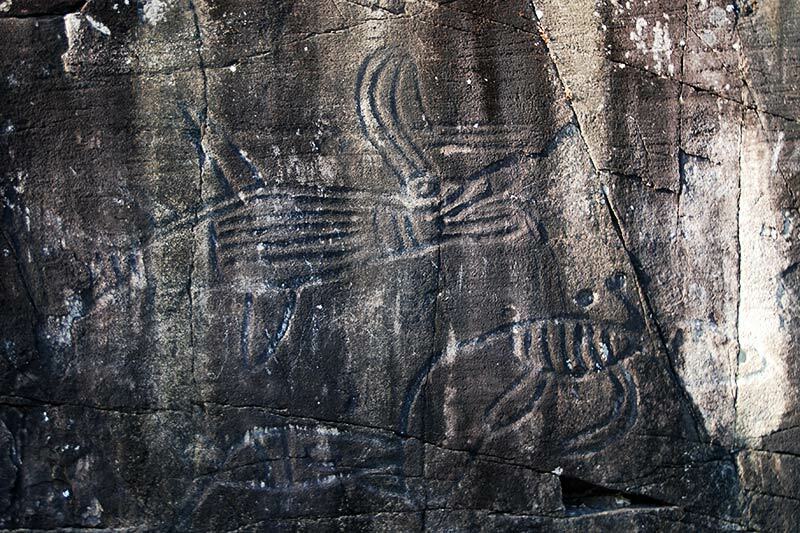 Little is known about the age of the petroglyph, who carved it, or why, but you can easily imagine this rock carving depicting mystical marine creatures, perhaps ancient monsters of Sproat Lake. 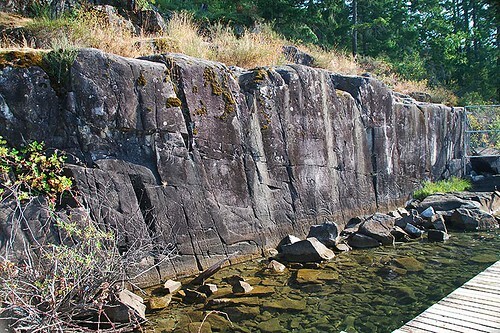 The petroglyphs are easily accessible, and can be viewed from a viewing platform positioned over the water in front of the petroglyph wall. During the forest fire season, the gigantic Martin Mars water bombers use the lake for their runway as they thunder off to extinguish forest fires. The largest water bombers in the world, these aircraft can scoop up to 27 tons of water off the lake surface. One or more of the enormous red and white water bombers are moored on Sproat Lake at the Coulson Flying Tankers visitor centre on Cherry Creek Road. There are 59 camping spots in two separate campgrounds in the park. Reservations are accepted. The campground is wheelchair accessible and has showers, pit and flush toilets, a sani-station and a boat launch. The Lower campground is open year around with fees collected April 11 to October 15. The Upper campground is open April 15 to October 15, the campground gate is closed during the off-season. A large public marina is located on site, and full amenities are available at Port Alberni. Port Alberni offers freshwater fishing that would be the envy of any fishing town anywhere in the world. The Somas River runs through the heart of town, and bank casting is possible from a number of locations beside Highway 4, and along Hector Road off Hwy 4 west of Port Alberni. Just north of Port Alberni, the productive Stamp River would probably make every chinook and steelhead angler’s Top Ten list. Beginning in January and lasting through March, a winter run of steelhead occurs in the Stamp River, while April and May are good months for steelhead fishing in Sproat Lake. Sproat Lake also has a solid reputation for rainbow-trout angling, particularly June through September. Use the boat launch at Sproat Lake Provincial Park to head out for some trolling or casting. In late summer, upwards of a half-million salmon make their way to the spawning grounds near the Stamp River Hatchery. Bank casting is permitted downstream from the hatchery. Follow Beaver Creek Road about 7.5 miles (12 km) north from Hwy 4 to Stamp River Provincial Park. Watch for pullouts beside the river along the way. The 39-hectare Sproat Lake Provincial Park is situated on the north shore of Sproat Lake, 8 miles (13 km) northwest of Port Alberni. Access to the park is directly off Pacific Rim Highway 4, or off Great Central Lake Road.